The box prominently featured the Ram Demon, the easiest of Estoroth’s lieutenants. 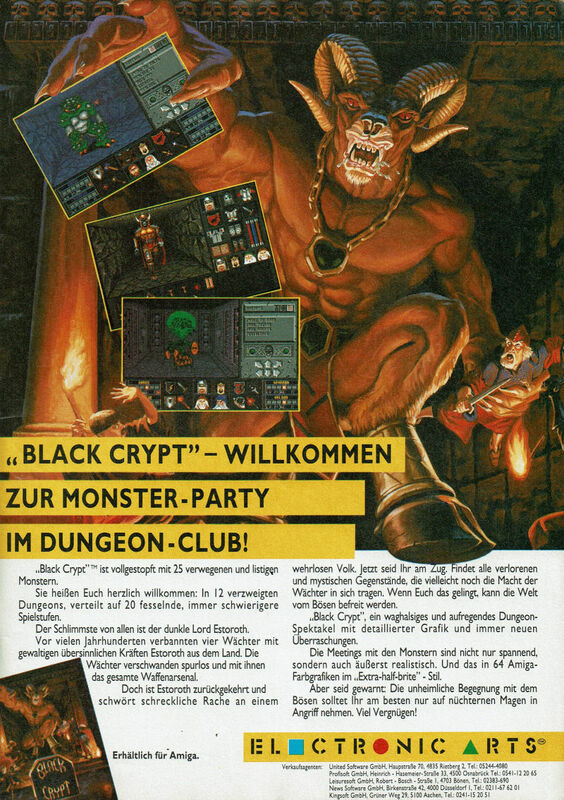 Black Crypt is a descendant of the Dungeon Master (1987) line. The player controls four characters of fixed classes (fighter, druid, cleric, and mage) on a quest to find four ancient artifacts necessary to defeat an ancient evil named Estoroth. Gameplay takes place across 28 levels of varying sizes, up to 40 x 40. Like its predecessors, it couples first-person, tile-based movement with fast-paced, real-time combat. 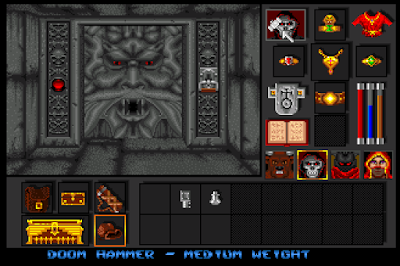 Character development occurs by leveling and acquiring new spells and equipment, but (as with all games on the Dungeon Master tree) standard RPG considerations frequently take a back seat to a variety of mechanical puzzles involving buttons, switches, pressure plates, teleporters, and other navigational obstacles. Although fun, it breaks little new ground and thus offers few reasons to play it over the games that influenced it. I should never underestimate my readers. I had resigned myself to putting together this final entry based on YouTube videos and had actually drafted a “Summary and Rating” without the “Won,” but Zardas came through. He did a bit of surgery on my save disk put together a save that worked out of non-corrupted parts of the disk. Having found the four artifacts, I only had to solve a pressure plate puzzle on Level 13 to get access to the final levels, 27 and 28. The mechanical puzzles disappeared on those final levels, and they were small enough that I didn’t bother to map them. Level 27 had a couple of conflicting messages, one suggesting that Estoroth couldn’t be damaged by magic, and one saying he could only be damaged with magic. The “Reveal Truth” spell showed that the first message was the accurate one. 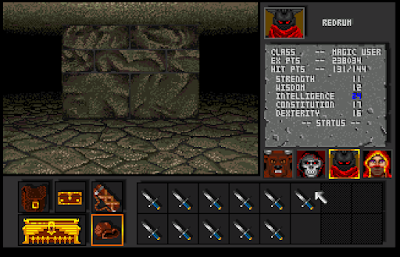 Enemies on the two levels are completely immune to spells. That was a bit disappointing. I don’t know what purpose it serves to render that aspect of character development meaningless on the final level. On Level 27, I had to defeat six skeletal guardians. Their magic attack was too powerful for my party to withstand more than two blasts, so I had to waltz them to death. (For new readers, the “combat waltz” is a maneuver by which you attack then quickly side-step and turn before the enemy can retaliate.) I can’t see how it would be possible to beat them otherwise. All the videos I consulted online showed the players doing exactly that. I suppose I could have used two Potions of Invincibility on my front characters, but I was saving those for Estoroth. These guys were so hard I couldn’t stop for a screenshot without dying. I can’t remember if I mentioned in a previous entry that waltzing is a little harder in Black Crypt than other Dungeon Master clones, largely because the enemies don’t follow a predictable pattern. You can’t side-step until the enemy has already committed to turning and facing you; otherwise, he could easily go the other direction. For some players, this would mean simply adjusting their fingers and switching the direction of the waltz. For someone less manually dexterous like me, it means flailing randomly at the keys and, in a best-case scenario–running to the other side of the dungeon so I can catch my breath, settle down, and figure out a new pattern. Once the guardians were defeated, I armed myself with the four artifacts and took a stairway down to Estoroth himself. At this point, I naturally forgot to use my Potions of Invincibility, but Estoroth was curiously easy. After I’d hit him just a few times with my melee weapons, the weapons began to sparkle. This was a sign to use their special attacks. It took a few tries to get the order right. Protector (the shield) protects the party from further damage; Soulfreezer (the staff) holds Estoroth in place; Vortex (the sword) opens a portal to another dimension; and Forcehammer (the hammer) sends him through. What made this banishment of Estoroth successful permanently? But afterwards, the player gets a scene-by-scene recap (about 15 scenes total) of the major game moments, including the various “boss” creatures defeated along the way: the Ogre, the Dracolich, the Medusa, the Possessor, the Ram Demon, and the Waterlord. In case we had forgotten. After one final concluding paragraph . . . 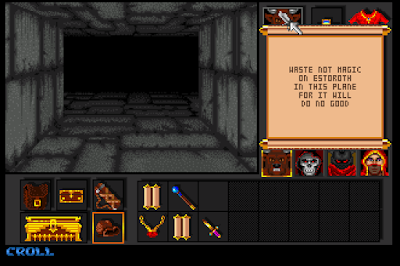 The final screen shows the Black Crypt destroyed.
. . . the party has the option to reload the final save and just poke around the dungeon. There really isn’t anything to do, but you can find the four ancient heroes’ skulls on Level 28, plus a few high-powered items. I had a reasonable amount of fun with Black Crypt. It’s a clone, but there’s nothing inherently wrong with clones. Without them, we’d have about a dozen total RPGs, and half of those would be weird one-off French titles. Clones allow you to get started without any confusion, let you settle in to familiar territory with a contented sigh. And despite the term, no “clone” is a 100% likeness. It’s fun to see the different variations the developers take with a common template, like listening to a new jazz band improvise on a number you’ve heard a million times. Even when its worse, it can still be interesting. 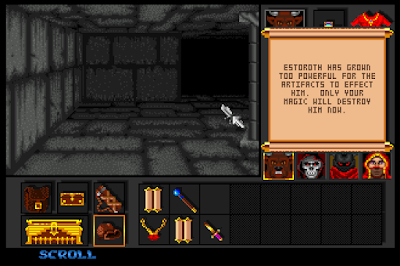 But Dungeon Master-style games face a unique challenge when it comes to this improvisation, because they’re mostly about mechanics. They tend to feature framing stories–that is, stories that have few references in the game itself, and could easily be swapped with a different frame–and no NPCs. 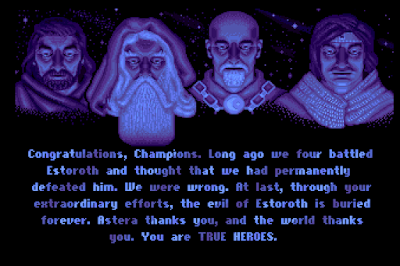 With an Ultima clone, even if the game plays the same as Ultima III or IV, you can still enjoy the new story and the variety of NPCs. Lacking such narrative options, a Dungeon Master clone has to rest all its improvisation on combat, exploration, and puzzles. That’s where Black Crypt falls a little short. Just like Dungeon Master, all I can tell about a weapon by looking at it is its weight. At least the door image is cool. 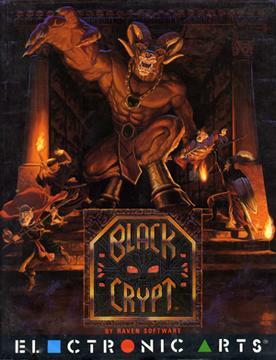 Only in its somewhat extensive ending does Black Crypt really distinguish itself from its predecessors. Oh, its graphics and sound are marginally better, but these are the things that an RPG fan–particularly a Dungeon Master fan–ought to care about least. Some of its puzzles also went in different directions, but rarely to the game’s credit. More often than in Dungeon Master or Eye of the Beholder, I found it difficult to judge the results of various actions. I particularly didn’t like the invisible pressure plates. There’s little point to mechanical puzzles if you can’t see the elements that make up the puzzle. 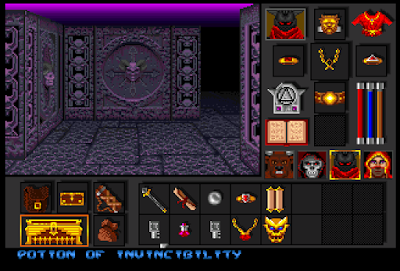 Meanwhile, Black Crypt fixed none of the problems that I had with Dungeon Master–inability to see equipment statistics and a needless food system among them. Even worse, it went in Eye of the Beholder‘s direction with character development, while offering none of Beholder‘s improvements, such as NPCs and side quests. The magic system is done a bit differently here, although in the end I found it neither better or worse than its predecessors. For all of these reasons, I expect it to GIMLET lower than Dungeon Master or Beholder. 1. Game World. As usual, we have more of a framing story than a backstory–a fact not changed by a few call-outs within the game (mostly in the form of messages from Estoroth that you find). The plot is derivative, and like most Dungeon Master clones, there isn’t much of a “world” here. But the levels are well-designed, with both textures and puzzles organized around themes specific to individual levels or small groups of levels. Score: 5. 2. Character Creation and Development. As noted, it takes a fairly major step back. You have to play four fixed classes. There are no significant choices during creation except for the portrait. Because the dungeon is linear and the number of enemies is mostly fixed, characters level at fixed intervals, and leveling doesn’t really do very much for them. I vastly prefer Dungeon Master‘s action-based leveling, in which each character can attain various levels in all “classes,” to Crypt‘s (and Beholder‘s) experience-based leveling. Score: 3. Using single classes and experience-based leveling was a regression. 3. NPC Interaction. There are no NPCs in the game. Score: 0. 4. Encounters and Foes. There are about as many different enemies as the typical game of this genre, with about as much variety in strengths, resistances, and special attacks. Most of the monster types and portraits are original to this game (or at least not taken directly from its sources). I just wish they had names. As is my custom, I’ll also use this category to throw in a couple of points for the puzzles, which serve in the place of role-playing “encounters” in this sub-genre. As above, I didn’t always like them, but they were pitched at the right difficulty. Score: 5. 5. Magic and Combat. I’ll never love combat that relies more on manual dexterity than attributes and tactics. 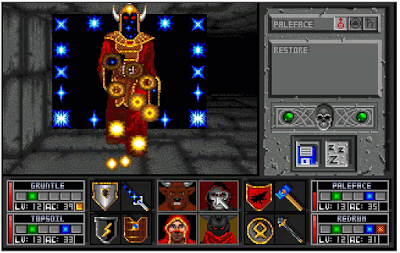 Dungeon Master at least provided a variety of different types of attacks with its weapons, plus hand-to-hand combat, plus a more useful in-combat spells system, plus the ability to attack from the inventory screen, plus other useful tricks, like the ability to swing around and use the two rear characters to attack the rear. Black Crypt‘s only innovations are to make waltzing (and similar patterns) more difficult and to introduce a different take on the spell system. It’s lack of buffing spells is also a negative. 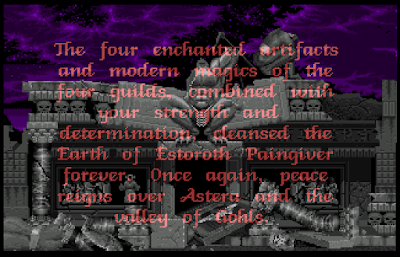 Still, it offers an arguably better experience than Eye of the Beholder, where you never got feedback on attacks, and waltzing made it possible to win with a single character. Score: 4. 6. Equipment. I liked the variety of equipment slots but almost nothing else. Looking at items offers less information than even Dungeon Master. I guess I’ll give a point for some originality with the “false” messages and the ability to right-click on most weapons for a special attack. Score: 5. As with most RPGs, I ended this one with plenty of unused equipment. 7. Economy. As usual for Dungeon Master clone, none. Score: 0. 8. Quests. The main quest has some fun stages, with various boss creatures every two or three levels. It also offers a little nonlinearity in the order you approach Estoroth’s lieutenants, but it otherwise has no choices, no alternate endings, and no role-playing. In this it under-performs its predecessors. Score: 4. 9. Graphics, Sound, and Interface. Some improvements here. The game is still a bit too mouse-heavy for my tastes, but at least you can customize the movement keys. I feel like there were a few more sound effects and slightly better graphics than Dungeon Master, at least, but perhaps not enough to make a difference in the score. The auto-mapping system is a nice addition, and I like how it’s logically integrated with the spell system (even if it took me a while to figure out). Amiga-philes will want me to note that the game uses an enhanced graphics mode (“extra half-bright”) that allows for 64 colors instead of the usual 32, but even the original 32 colors is about 24 more than I can discern. Score: 6. 10. Gameplay. It’s as linear as most dungeon crawlers, but at least offers some flexibility after Level 13. Unfortunately, the fixed character classes make it less replayable than its counterparts. Otherwise, difficulty and length were both good. Score: 5. That gives us a final score of 37, just north of my “recommended” threshold, but below the 41 I gave to Eye of the Beholder and the 47 I gave to Dungeon Master. (I must say, reviewing my Dungeon Master scores, I was a bit generous in several categories and I think it would likely rate closer to a 43 if I rated it now. I didn’t have a lot of perspective during my first year.) Fans of this subgenre would argue (not entirely without a point) that perhaps it shouldn’t be faulted for lacking NPCs, a dynamic game world, and an economy, since that’s not what this subgenre is about. If it thus makes you feel better, you can think of it as rating closer to a 44 (and Dungeon Master closer to a 58) with those categories eliminated the rest of the values rescaled accordingly. As an Amiga game, Black Crypt was heavily promoted in Europe. Computer Gaming World offered a “sneak preview” of the game in the February 1992 issue, but it never seems to have offered a review. The preview, written by Allen Greenberg, is extremely positive. Nothing he says is wrong, exactly, but he suggests that the game is better than Dungeon Master, and I find it difficult to imagine any fan of this subgenre agreeing with that. In particular, he seems too infatuated with fairly modest improvements in graphics and sound. Greenberg sets up the review by suggesting there’s a war brewing between keyboarders and mousers, so I’m at least glad to see that the interface issue was heavily debated in the day. Amiga-specific magazines tended towards high scores, with .info coming in at a perfect 100 and Amiga Action giving it 93/100. Non-English Amiga magazines were, as usual, a bit more conservative, with scores in the 71-90 range. Black Crypt was the first title from Wisconsin-based Raven Software, which still exists as a subdivision of Activision (it was sold in 1997) and is currently in charge of the Call of Duty series. 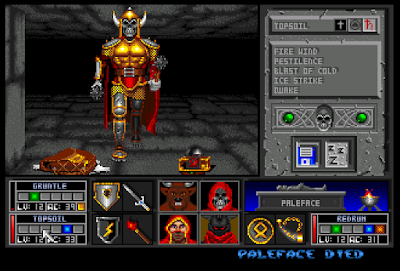 The company’s co founders, Brian and Steve Raffel, reportedly began outlining the game in the 1980s. They enlisted two programmers, Rick Johnson, and Ben Gokey, and had a demo ready for the 1990 Gen Con, where it was picked up for distribution by Electronic Arts. (I had originally thought that Crypt owed its lineage to Dungeon Master via Eye of the Beholder, but the game would have been mostly finished when Beholder came out.) It was the first game for almost everyone on the team. An Amiga-only game in 1992 was bound to make a small splash in the United States, which probably explains why the company abandoned the platform for future titles. At the same time, they also mostly abandoned RPGs in favor of first-person shooters, some with light RPG elements. 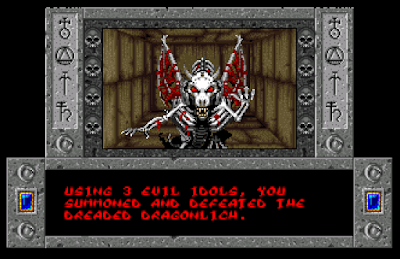 Whether we ever see them again on this blog depends how I rule on games like ShadowCaster (1993), Heretic (1994), Hexen (1995), Mageslayer (1997), and Hexen II (1997), all of which are on my list preliminarily. Today, the company is better known for its Soldier of Fortune (2000-2003) and Call of Duty (2010-2017) titles as well as its work on later entries in id Software’s franchises including Quake 4 (2005) and Wolfenstein (2009). Any RPG fan is going to want to read Jimmy Maher’s survey of Dungeon Master descendants, published a few weeks ago. Based on his review, we only have four left (at least until a more recent surge of “retro” games): Lands of Lore: The Throne of Chaos (1993), Dungeon Master II: Skullkeep (1993), Eye of the Beholder III (1993), and Stonekeep (1995). (And maybe Liberation: Captive II ? I’m not sure if it uses the same engine and approach as Captive.) It doesn’t sound like any of them are likely to outperform the original. It’s too bad that this subgenre never reached a true peak before it was subsumed by real-time movement in the vein of Ultima Underworld (1992), but given its forthcoming demise, I’m not sorry that it had one decent 1992 entry.